Estimating your taxes before you file your tax return is an essential part of tax planning. However, income tax computation requires good knowledge of taxation laws:( Thus, looking at the hardships faced by people, we created a simple online tax calculator tool to help you easily estimate your tax refund or tax payable to the government. Our income tax calculator calculate taxes, on the basis of latest provisions of the income tax act and rules issued by the Income Tax Department. If you think your friends/network would find this useful, please share it with them – We'd really appreciate it. Q What is income ? Income means the amount that an individual earns in exchange for providing goods or services.In other words, income is the sum of all the wages, salaries, profits, interests payments, rents, and other forms of earnings received for a period of time. Income from House Property. For detail please click here . Q What is income tax ? An income tax is a direct tax which is imposed on assessee depending upon the their respective income or profit. In other words, it is the tax levied on the income earned. Q When income tax is required to be paid ? Income Tax is required to be paid when your income exceeds the Basic Exemption Limit. This limit is specified by the government every year. Currently, it is Rs. 2,50,000 for Individual below the age of 60 Years. Q What is the period for which tax is calculated? Tax is charged on any income earned during the period April 1- March 31. The year in which the income has been earned is known as the ‘previous year’ and the year in which the tax is calculated, is known as the ‘assessment year’. Q What are the benefits of tax calculation beforehand? You should calculate Taxes beforehand so that you are able to set aside the funds which you will be needing for paying taxes at the time of filing return.Therefore, at the time of return filing, you don’t have to rush for arranging funds.The other benefit is, it lets you know that whether your taxes will go up or down in comparison to the previous year. Q How to calculate income tax in India? In India,the Income tax is calculated on the basis of tax rates and slabs defined by Finance Ministry in the budget which is presented every year. Q What are the income tax slabs and rates? Please note that from F.Y 18-19, EC & SHEC shall be replaced by the Health & Education [email protected] 4%. Further, for understanding the other slabs of various taxpayers, please click on this link. Q How to calculate income tax for salaried person ? Income from Salary - 8,00,000, Income from Other Sources - 2,00,000, Deduction u/s 80C - 1,50,000. So, total income would be = 8,50,000. (8L+2L-1.5L). Next 3,50,000 - 20% i.e. Rs. Rs.70,000. Q What is TDS? How to calculate monthly TDS amount ? Tax Deducted at Source (TDS) is a mechanism whereby the tax is deducted directly at the point of origin of income and submitted to government.It enables speedy collection of taxes.You can claim this tax paid as a credit while filing your income tax return.In case of salary income, it is the responsibility of your employer to deduct the TDS and deposit it to the government. For the purpose of calculation of monthly TDS amount, just calculate your taxes from the above calculator and divide it by 12. You will get your monthly TDS amount. Q How does the government collect income tax? Voluntary payment by the taxpayers like Advance Tax and Self-Assessment Tax. Tax Deducted at Source (TDS) which is deducted at the point of origin of your income even before receiving it. Taxes Collected at Source (TCS). Q How to calculate Income-tax for FY 2017-18(income tax calculator AY 2018-19) using Tax2win? Click on this link or visit the income tax calculator online page of Tax2win. Fill all the details as required for tax calculation. Q Can this calculator compute my tax liability post budget 2018 ? Yes, It will help you understand the impact on your Income-tax liability after the Budget 2018. Q Does this Income tax calculator computes my final tax liability? Yes,it computes your tax liability on the basis of information entered. You can surely use the same for your tax planning for 2018-19. Your Income-tax liability will be more or less same, subject to the actual information. Q Why should i use an online tool for Income Tax Calculation? With the help of an online tool it becomes easy to estimate your tax payment for the year. You can use the calculator by Tax2win. It is a quick, simple and user-friendly way of estimating how much your income tax liability and provides you with fast and accurate calculation. Q How to calculate tax liability for F.Y 2018-19 (income tax calculator AY 2019-20)? There has been no change in the existing income tax rate for the financial year 2018-2019 except the abolishment of EC & SHEC and introduction of Health & Education Cess. Further, apart from the rate there has been various changes in the deductions. For detailed understanding of the changes of Budget 2018, please click here. For Expert opinion , you could also approach us and avail our CA Assisted services. Q What is rebate under section 87A of the income tax? 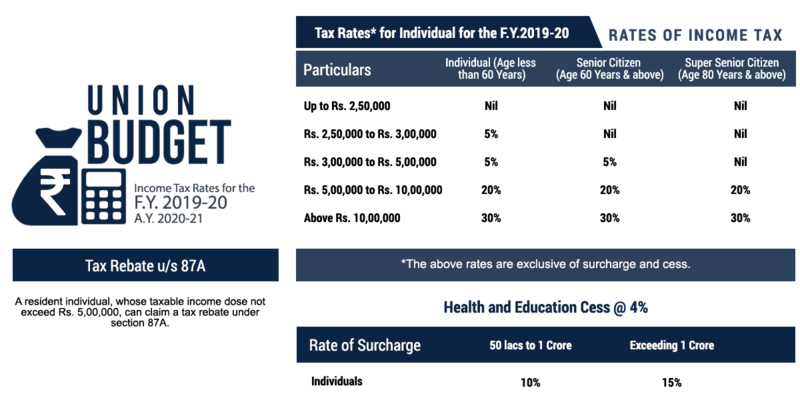 Q Is there any change in the income tax slab after budget 2019? No change in the income tax slab in the budget. Q What are the new income tax slabs in India after Interim Union Budget 2019? We hope our free income tax calculator india was able to help you in calculating your income tax payable or refund. Also, if you want a HRA calculator for AY 2019-20 & AY 2017-18, visit our online free HRA calculator page.